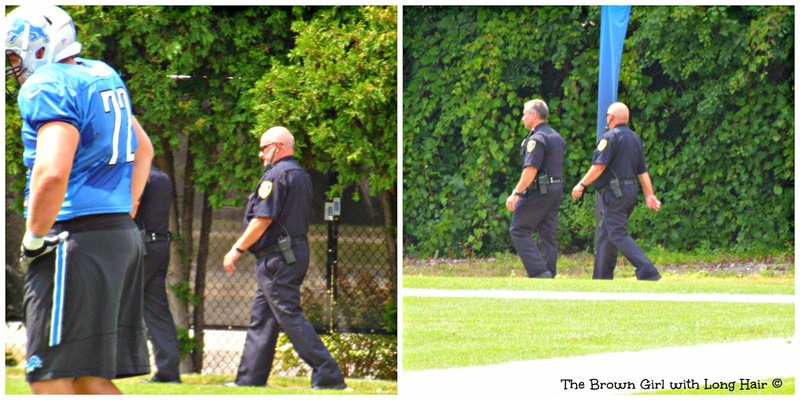 I don't know about you, but I had long assumed that an NFL training camp session would look fairly similar to a high school football team's practice: You know, a lot of huffing and puffing from the players, sidelines littered with Gatorade squirt bottles, and a coach or two wielding a clipboard and a whistle. 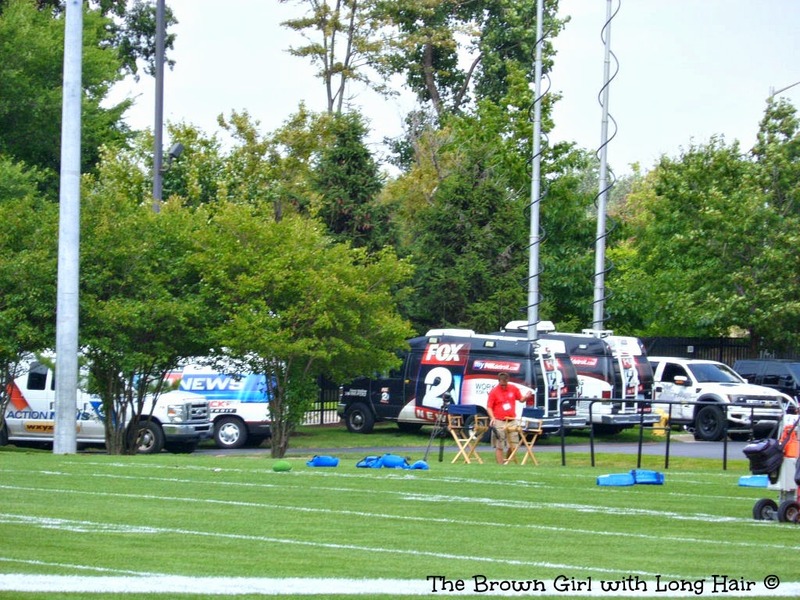 And then I actually attended an NFL training camp session and realized that I was wrong. It is more than just a practice, it is pure entertainment that is, in some ways, more fascinating than The Big Game itself. 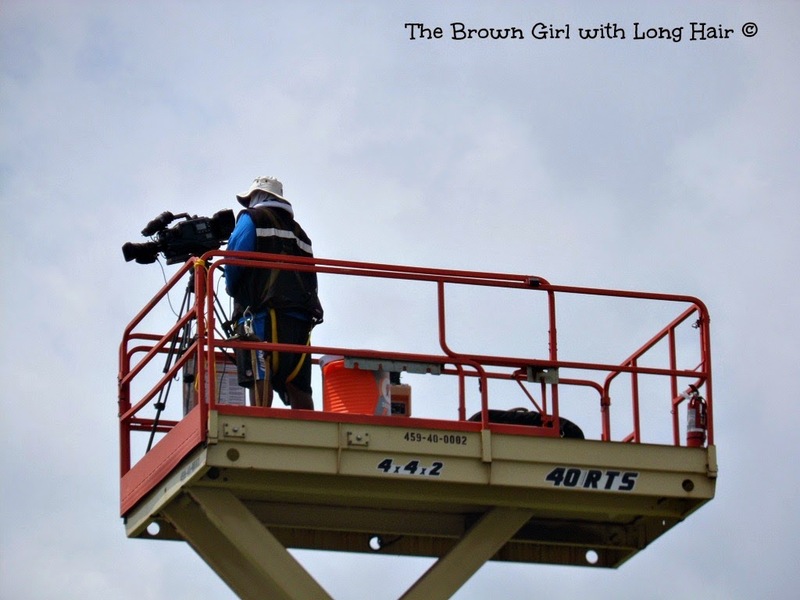 If you blink, you might just miss something, so I was fortunate that The Hubs was present to run interference for me (that's a football term) and provide an explanation for things that I thought I understood but in actuality did not. Lions staff accompany Scott and me onto the field at the exact moment that players are exiting the locker room. 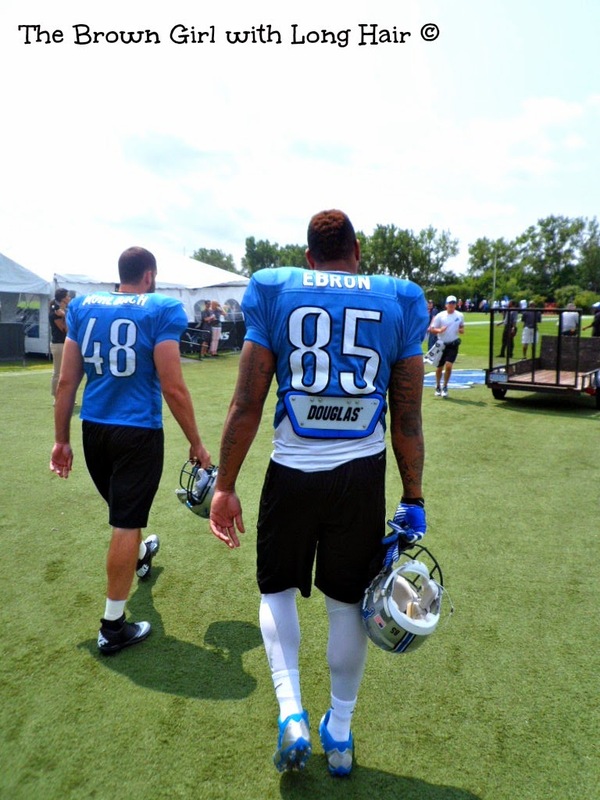 I join the line right behind tight end Eric Ebron, the Lion's first round draft pick (and 10th overall) in the 2014 NFL Draft. Practices are recorded so that the players and coaches can break it all down later in a room that looks nearly identical to a college lecture hall. 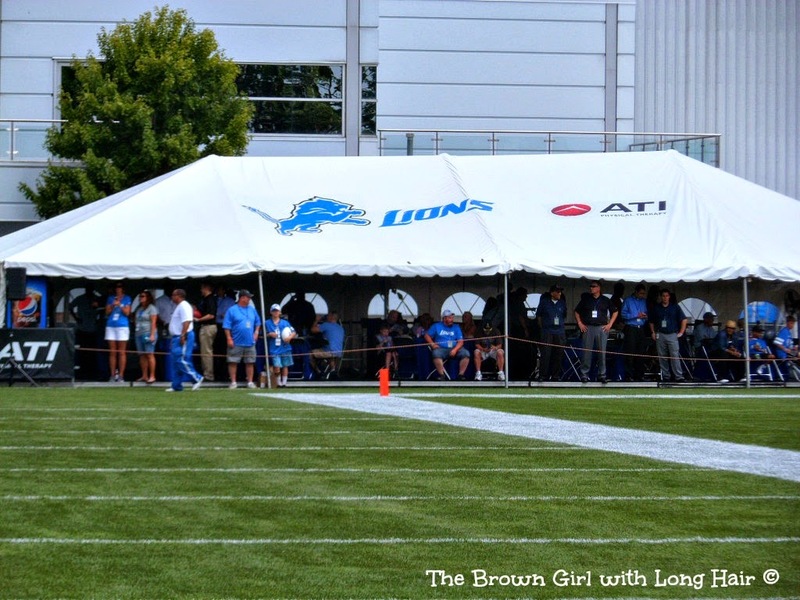 Above the tent hangs this flag: In March of this year, the Detroit Lions mourned the loss of William Clay Ford, Senior, who had served as the organization's owner since 1963. In Ford's honor, Lions players will this season don a patch on their uniforms that is identical to the flag. 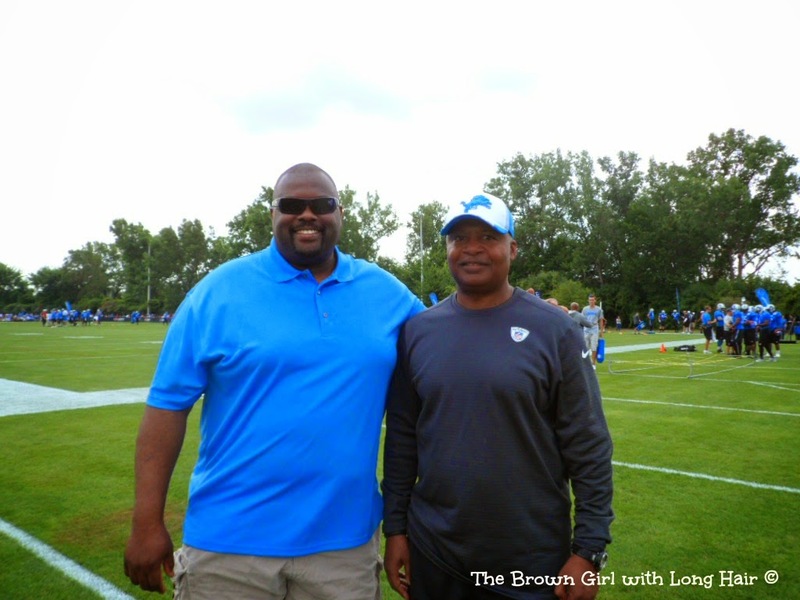 Scott with Detroit Lions Head Coach Jim Caldwell, who is just all-around awesome. While his players took a break between drills, he came over to welcome us and say hello. I caught Scott looking on, deep in thought, as members of the offensive line -- the position that he used to play -- ran through drills. Having walked in these players shoes for nearly seven seasons, Scott knows what these players are about to do before they do it. Members of the Lions defensive, including defensive end Ziggy Ansah, linebacker Kyle Van Noy, defensive end Jason Jones, and defensive tackle Ndamukong Suh taking a break between drills. Lest anyone get any ideas to run up on the players, there is security on standby. The actual referees that call games during NFL games during the season are the same ones that attend training camp. And unbeknownst to many, these referees already have a primary job -- they are lawyers, doctors, airline pilots, and educators. 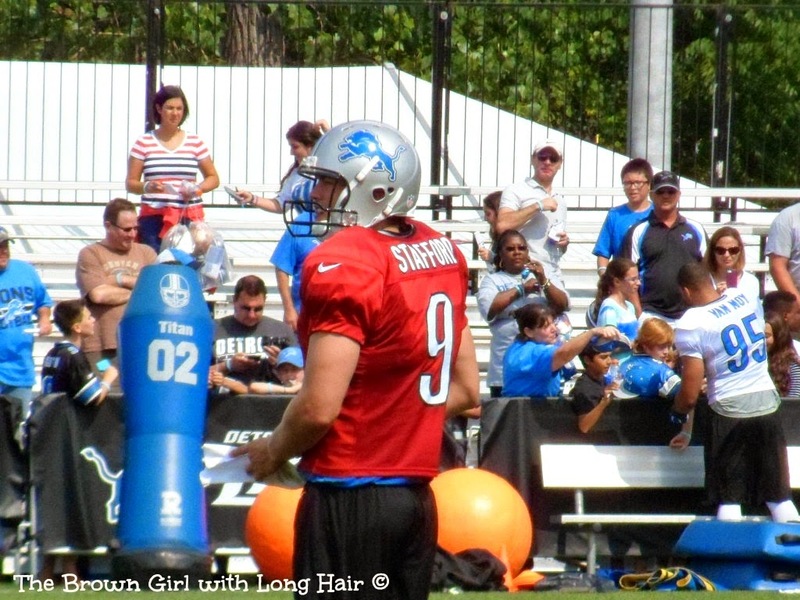 Detroit Lions Quarterback Matthew Stafford in action. We were literally standing a stone's throw away from him when this photo was taken...which makes focusing on picture taking rather difficult when you're constantly looking over the shoulder for a flying ball. Similarly, Scott and I were right in the thick of it when wide receiver Calvin Johnson -- aka "Megatron"-- ran this play. I'm not even kidding when I saw him running in our direction with break-neck speed, I did the sign of the cross and said a silent prayer that I wouldn't become spectator roadkill. 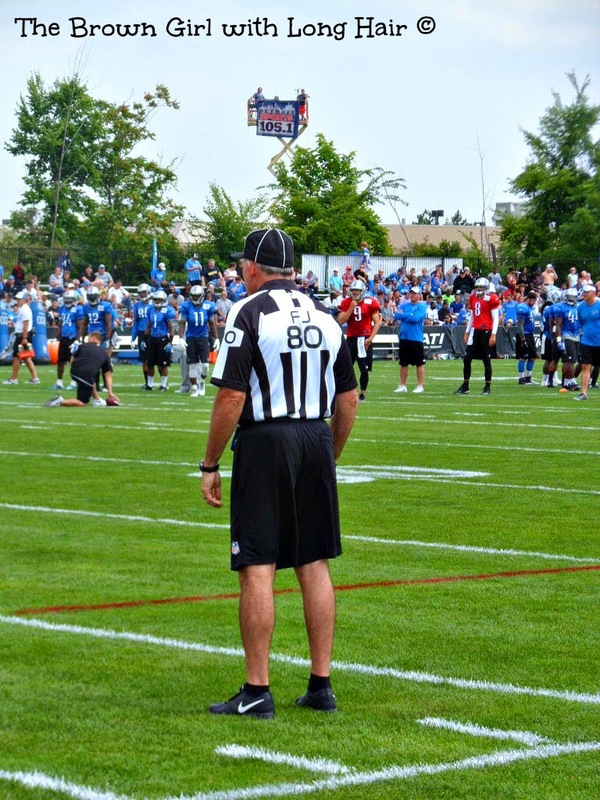 The Detroit Lions are among a select group of NFL teams that have installed Zebra Technologies' real-time tracking system. 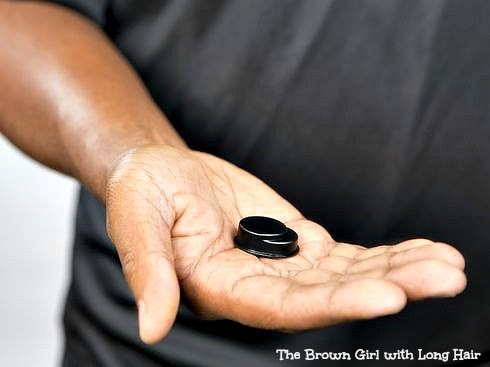 The system involves players wearing a tiny black chip under their should pads, which will help teams to evolve training, scouting and evaluation through increased knowledge of player performance. This chip can actually detect the speed, distance, and duration of a player's run. Near the end of practice we are greeted by a very familiar face: Lions Athletic Trainer Joe Recknagel, whom we refer to as simply "Trainer Joe." 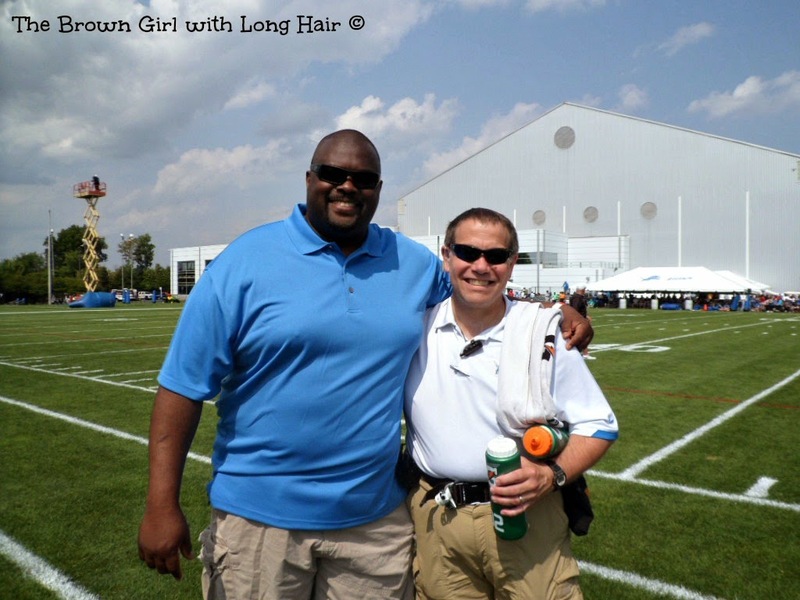 Having been with the Lions organization since 1980, Joe was a part of the staff when Scott played for the Lions. The many faces of Reggie Bush: A crush of media descends upon the running back the minute practice ends, and he handles every question like a consummate professional. 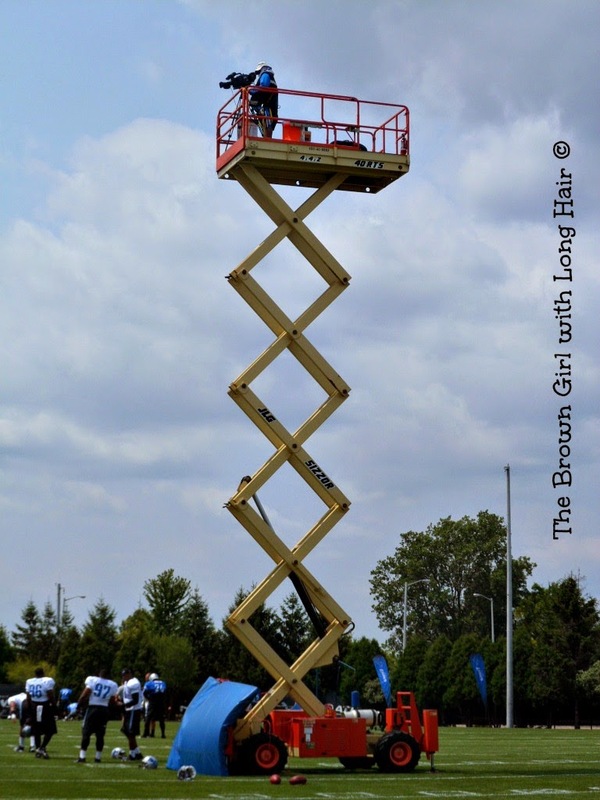 This photo, courtesy of the Detroit Lions, captures the perfect ending to a wonderful summer afternoon. Click here for a chance to win a FREE one-year subscription to Live Happy magazine! Whoa! This is totally different then high school football practice! 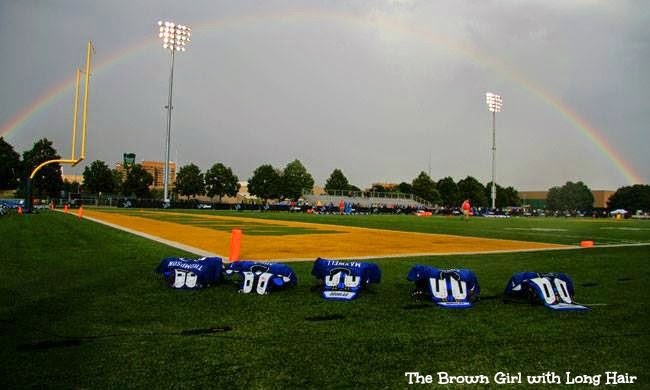 The last picture with the rainbow is phenomenal You always have a way of making football interesting! Good Morning, Susie! Honestly? Can I tell you something? Your comment about making football interesting SO made my day. 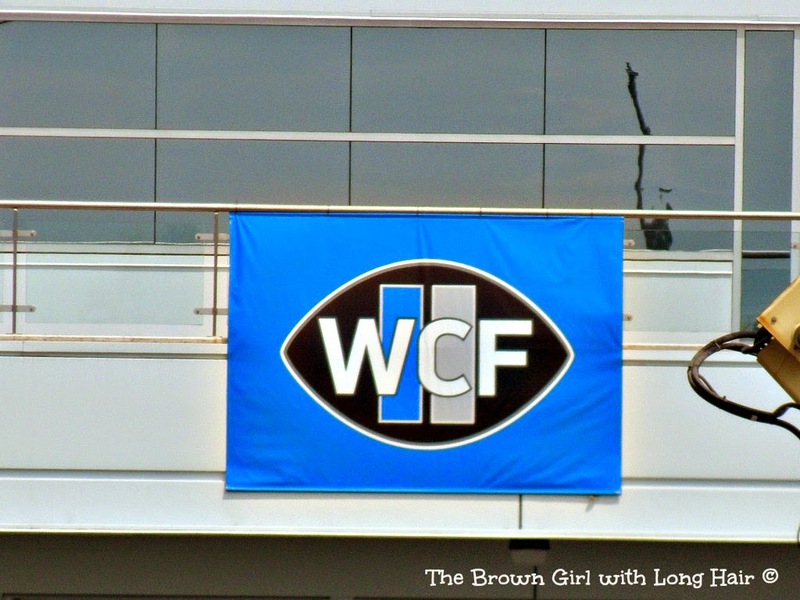 :-) Sometimes I feel as if readers might tire of my "dose" of football, but it's who we are. And NOT sharing it would be contrived. 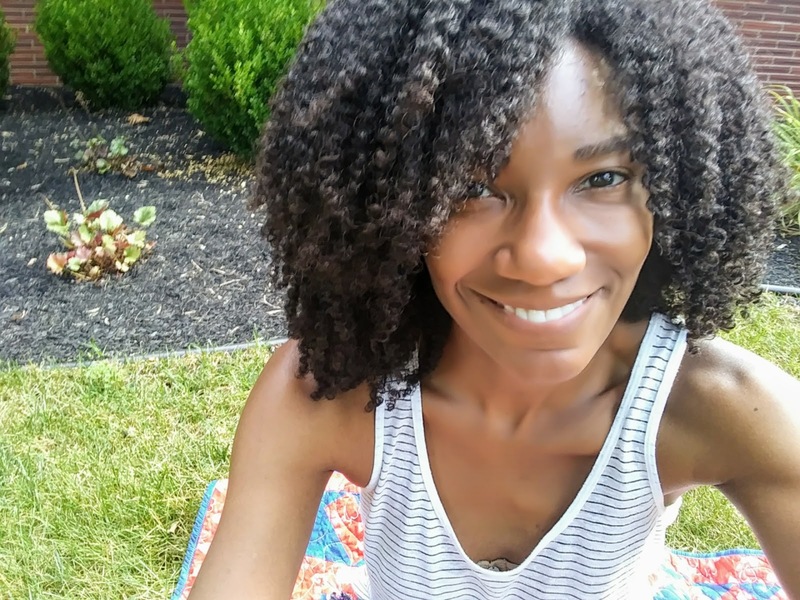 So my goal is to share our experiences in an approachable way. Your comment really, REALLY means a lot. Awww, your welcome, Courtney and it is true! Steve loves football, but I don't. When I read your post about football I understand it and hime better! It is so cool you're able to be up close to all the action Courtney! For the fans, do they have to pay to watching the training? Hi, Louida! 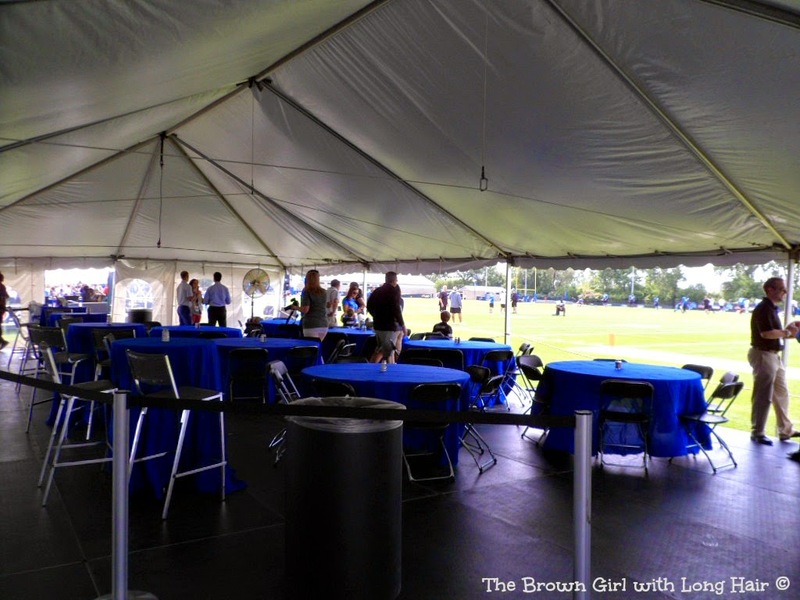 No, actually, attending any NFL training camp session -- even for your beloved Raiders! -- is always free. However, general fans have a bit less access than we had because they are not able to access the field -- I take that back; *sometimes* there is standing room only around the perimeter of the field. Fans are just not allowed directly on the field. 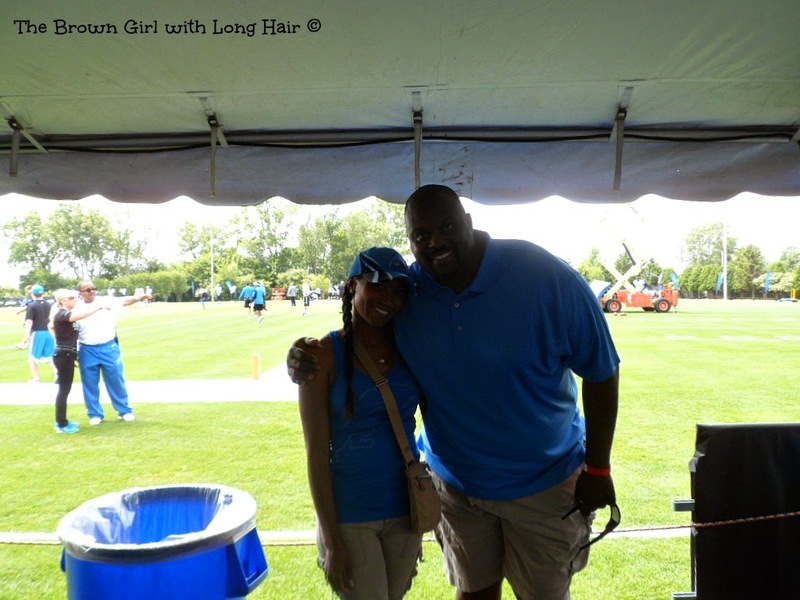 Still, it's a great opportunity for fans to see the inner workings of their NFL team -- and there are autograph sessions afterwards, so fans are always encouraged to bring any memorabilia that they want autographed. Thanks Courtney! I always had wonder this. 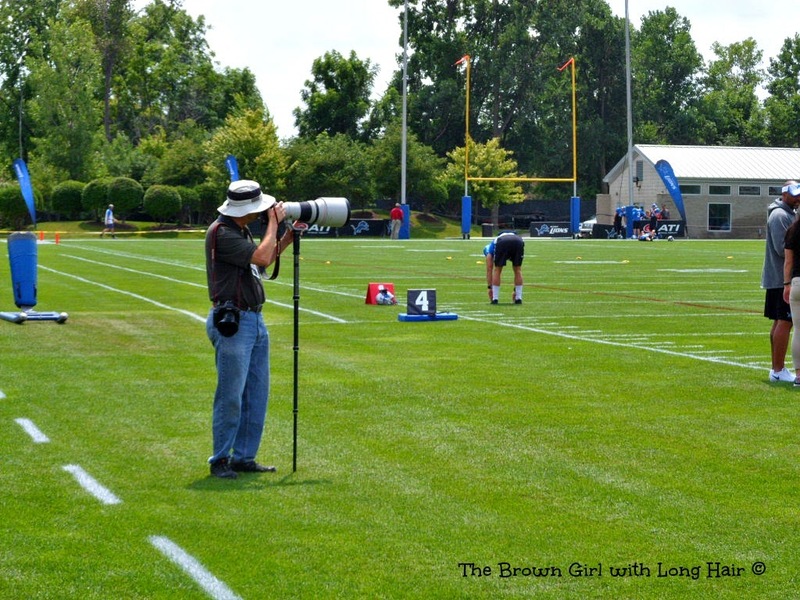 It's so fun to see training camp through your eyes as fun...and not work! Great pics! 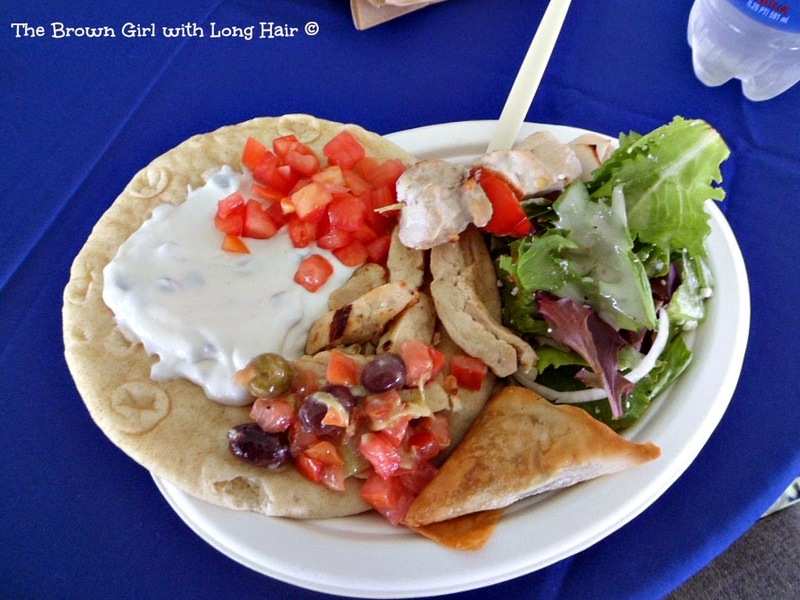 I don't even know where to begin because I'm SO excited about this ENTIRE post and I'm not even a Lions fan (sorry!). 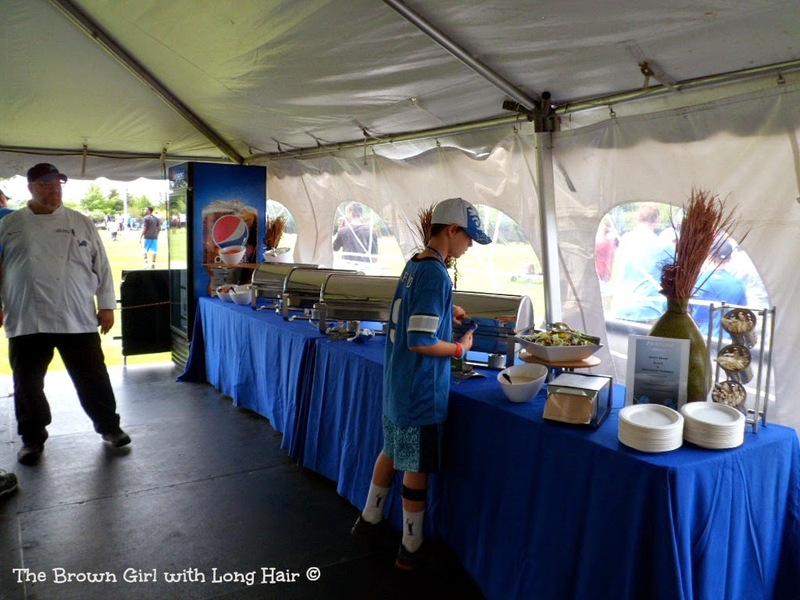 All of it is just way too cool - being on the field, talking with the coach, your husband's feelings about being there, the FOOD!! All of it. I would absolutely love to do something like this one day. And my favorite line? "I did the sign of the cross and said a silent prayer that I wouldn't become spectator roadkill." hahahaha! I cannot even imagine being in his sightline as he's running full speed!? Amazing! And one more thing: Please, please, PLEASE never apologize for not being a Lions fan. Here's the thing: I want EVERY fan to feel welcome here. The way I see it, every single NFL franchise is part of one family -- the NFL family. I love it when people are die-hards for their team -- that's how it's supposed to be! Wave the flag for your team, girl!!! Thanks for the run down. It looks like you had fun. 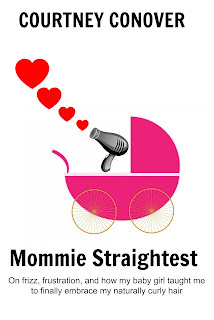 Good facts and tidbits info. I had no idea the referees had other jobs. But make sense for sure! I think many -- if not most -- would be surprised to hear the tidbit about the refs -- I know I was. Thanks, again, for stopping by. Hi, Lexa...and thank you for taking the time to comment! Oh wow! This is so cool. 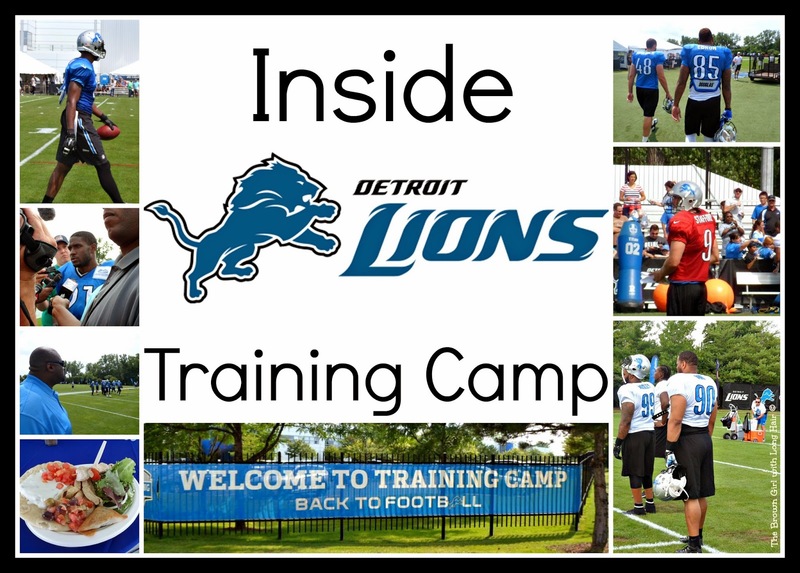 What an awesome behind the scenes look at training camp! It looks and sounds like you were well fed. I had no idea that referees did other work... I just thought they were full-time referees LOL. Thanks so much for putting this together and giving a glimpse of something we otherwise wouldn't see! The sole impetus behind this post was exactly that: To give people a glimpse inside an arena that they likely wouldn't see -- even if they did attend training camp as a public spectator. Your comment means a lot. Wishing you a lovely evening as well, my friend! How fun! Those chips are so cool. Thank you for visiting -- and commenting.